In some of previous posts, I've discussed how it is possible to generate RF directly from the Raspberry Pi using the clock pin, and I've also mentioned the excellent LPF kits for the Raspberry Pi available from Language Spy. 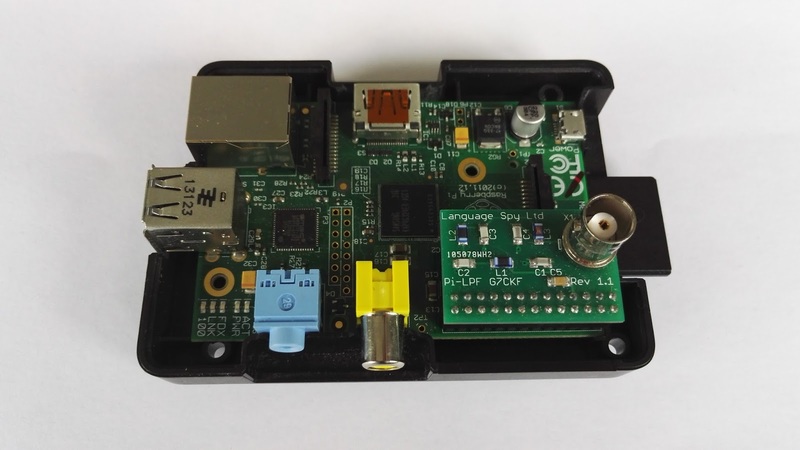 In this post, I'm going to bring this all together and show you how to setup a simple WSPR station using the Raspberry Pi. I would recommend starting off with an up-to-date version of Raspbian Jessie which can be downloaded from RaspberryPi.org. You can check the time is correct by typing "date" at the command prompt and pressing Enter. Compile the WsprryPi code by typing "make" at the command prompt and pressing Enter. Your WSPR station is now almost ready to go, however please note that in order to use this software and to transmit you MUST be a fully licenced radio amateur. Decide which band you wish to transmit on, and install an appropriate LPF filter for that band. The photo below shows my Pi with one of Language Spy's 20m LPF filters installed. replace LOCATOR with your 4 digit Maidenhead Locator code. The option "-r" tells the WsprryPi software to repeat the transmission sequence indefinitely, until you press "Ctrl-C"
The final "0" tells the WsprryPi software alternatively transmit for 2 minutes and then wait for 2 minutes. You can check to see who is hearing your transmission by going to the WSPRnet site and searching for your callsign. I find the "Map" feature very helpful - simply enter your callsign and the band you have been using and you will get a map of the world showing the locations of receiving stations. Here's a screenshot of my results from as few days ago. It's amazing the fun you can have with just 10mW! Once you are happy that all is working as it should, you can run your Pi in "headless" mode and use SSH from another computer (or your phone) to launch the WsprryPi program. Hi, I'm getting asked for a user name and password when I try and GIT the wsprry code?? Bit of a linux /pi beginner but I can cut and paste and follow instructions? ?pi & raspberry don't work.....any guidance welcome. Will it run on a Pi zero?? Hi, Hope you can help please! Trying to load and run the software, am able to run the git clone https command ok, and on changing into the WsprryPi directory on running the make command I get the following error. I have updayed oth o/s and tryed as root also with the same result. It just crashes when I try to run it. It sometimes gets to waiting for transmission and sometimes it gets as far as calibration.